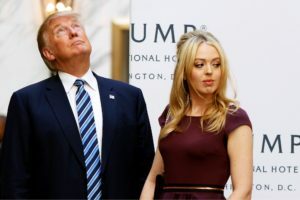 According to sources in the White House, President Donald Trump considered appointing his youngest daughter Tiffany to the position of acting United States Attorney General. He is said to have told them that after she graduates Georgetown Law School she would have assumed the position on a permanent basis. There was some concern among the president’s advisors that her appointment, aside from her lack of real world experience let alone a degree and admission to the bar, could end up being a distraction. That, however, may very well be the reason for her selection as the president fends off an increasing number of inquires regarding his administration. Democrats said to be familiar with the plan vehemently objected to the idea. Republican members of Congress, however, cite John F. Kennedy’s appointment of his brother Robert to the post and see this as yet another attempt by their colleagues across the aisle to put country over party. Tiffany Trump, twenty-five year old daughter of Donald’s second wife Marla Maples, has long been an outsider in the Trump family. While virtually ignoring her existence the president quickly appointed her half siblings to influential positions in his administration and financial empire. His eldest daughter Ivanka, a fashion designer and reality television personality, is listed as a White House advisor. His son-in-law Jared Kushner, in addition to being the father of Trump’s grandchildren, is the president’s official Senior Advisor and possibly his third or fourth Chief of Staff. Trump’s other dependents, eldest sons Donald Junior and Eric, are overseeing the Trump Organization to blunt the appearance of the obvious conflict of interest that their father’s decisions may have. It’s also been rumored that Trump’s youngest son Barron 12, is next in line to run the U.S. Treasury when his school lets out for the summer. This entry was posted in Legal, Politics, Satire and tagged Attorney General, Donald Trump, Georgetown Law School, Marla Maples, Tiffany Trump by gprowler. Bookmark the permalink.